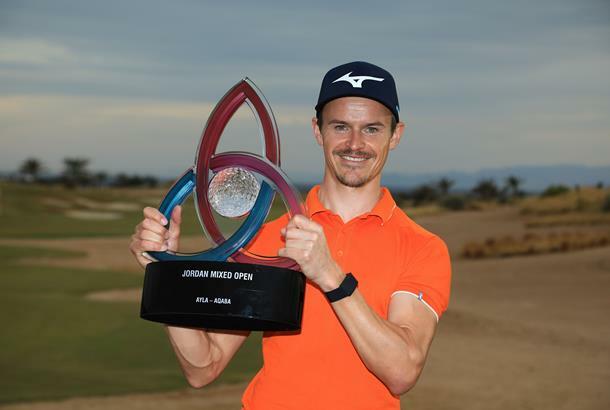 Daan Huizing became the first player in history to win a full-field mixed professional tournament by winning the Jordan Mixed Open presented by Ayla. Daan Huizing made history this week as he triumphed at the first Jordan Mixed Open, where 40 players from each of the Challenge, Staysure and Ladies European Tours all competed for the same trophy. It was a tournament that proved its worth as the final group featured a player from each of the three tours, with Huizing two shots behind overnight leader Meghan MacLaren. MacLaren put on an impressive display over the first two days as she carded consecutive rounds of seven-under 65s, and quickly put more distance between her and the chasing pack with three birdies on her opening five holes. But Huizing was determined, making birdies on the sixth and eighth holes to chip away at MacLaren's lead. She then opened a door for the Dutchman as she bogeyed the 10th and dropped two shots on the 11th, leaving them tied at 14-under-par. MacLaren couldn't improve her score over the final seven holes, and Huizing pulled ahead in the first-of-its-kind male and female golfer battle with back to back birdies from the 12th. He recovered from a dropped shot on 14 with another birdie on the 16th, signing for a four under par 68 for a two stroke victory. "I'm buzzing. It's a big moment for me. I've had a rough time at home recently so this is a really sweet way to prove to myself that I've got it. The belief in myself and the people around me, my team and my family, I'm really grateful for their support. I'm honoured. I think it's an historic event. "To be the inaugural winner — it's a special moment. I think it's a great initiative. It was great fun playing in a final group with a Challenge Tour player, a senior tour player and a lady player. It was a great battle. It's a different vibe and very special to be the first winner and I hope it's something that can be continued in the future. "I went into the day with a pretty open mind and I knew it was going to take a low round, someone was going to shoot low today. I had a pretty rough start and lipped out a couple of putts for birdie and holed a couple of good ones for par on two and three. It wasn't easy and I didn't play great. I had a few loose ones to the right yesterday and today again, but I battled really well. MacLaren, who finished alone in second place, was obviously disappointed to have lost, but was keen to take the positives about the event as a whole. "I'm obviously pretty disappointed not to win this week, having been in such a good position, but it was still an honour to be here and represent women's golf alongside two other great tours. "Female golfers have done ourselves proud this week and it's been a great environment to be in with all three tours. "It's been an honour to be here and it was a great concept and one that I hope can catch on in the future. The research that went into it played out with the scores because it was pretty comparable across the three Tours so I'd like to see it happen more often. "I think they did a great job considering that it was the first time that something has been done like this and I think that's a great sign for the future. "In some ways, it felt like just another tournament, trying to get the best score possible at the end of the week. It's definitely interesting to have different golfers alongside us. There are things that the guys can do and we can't but there are things that the girls do better than the men as well. It was definitely interesting and something that could happen more often. "It's not so much frustration as disappointment. It hurts, but that's golf sometimes. Golf happened. I missed a couple of putts, which doesn't help and hit a couple of bad shots at bad times. You can't afford to do things like that. It can change so quickly and everyone who plays golf knows that. "It hurts to not win, but I know, when I get home and think about it, I'll be proud of what I've done this week and I hope that I've represented the LET and women's golf in general as well as possible. It deserves a bit of a spotlight and if this kicks things up a bit, then I'm proud of what's happened." Martin Simonsen, who matched the Ayla Golf Club course record with a final round of eight under par 64, finished in third place.